I highly recommend watching Magic Mike XXL. You can watch it with your girlfriends or you can watch it with your significant other, for sure. It’s definitely not appropriate for kids, of course. After being a fan of the original Magic Mike movie, I couldn't imagine where they would go with the story line for Magic Mike XXL. I'm a huge fan of Channing Tatum and I think he's an amazing actor (It doesn't hurt that he is totally gorgeous and a rockin' dancer). This movie did have a slow start for me, but got better and better as I watched, and, I have watched it a couple of more times since. Mike is working for himself as a successful furniture designer when he receives a call from one of his dancer buddies that he was in a group with. He essentially lies to Mike to get him to go visit him, and when he gets there, he realizes it was a hoax, and found out they were on their way to a stripper convention. Mike decided since he's his own boss, he would join back up with the group and take some time off from the furniture design life. He also comes up with the idea that they will not do the traditional stripping routines (fireman, policeman, etc). I really enjoyed Gabriel Iglesias (Tobias), who is the group's MC, and takes them to their gigs. While driving one day, he loses control of the truck and ends up in the hospital. This leaves them with an opening, but Mike comes up with a solution, and meets up with an old friend, Rome (Jada Pinkett Smith; Collateral, Scream 2) who is doing very well for herself. She runs an entertainment business, and after seeing the boys, she decides to be their MC along with another woman, and even a few of her own male dancers. I can only imagine the hours of choreography and practice that these men had to do. The dancing was amazing; I loved every minute of it. Even Twitch, an all-star from So You Think You Can Dance was a part of this movie. He truly is a very inspirational dancer and he's got some serious moves. Also, before all this, I never knew that Channing Tatum ever danced; and let me tell you, he can dance. They all definitely brought the stripping routines to a whole new level. They achieved their goal of not being your traditional strippers; all while being even more sexual with their moves, if that's even possible. I do believe that all their hard work and dedication paid off. Presented in 1080 AVC codec, Magic Mike XXL looks amazing. The film has zero grain with sharp images and vibrant colors. The 5.1 DTS-HD soundtrack is quite impressive, especially for not being an action film. Dialog is concentrated on the center channel, while the other speakers delight you with a pulse pounding soundtrack. The extras are definitely worth taking a look at. I was able to understand more about the amount of work that went into this movie; not only learning your lines but the exhausting hours of practice learning dance moves. The extras include The Moves of Magic Mike XXL, Extended Malik Dance Scene and Georgia. I highly recommend watching this movie. You can watch it with your girlfriends or you can watch it with your significant other, for sure. It's definitely not appropriate for kids, of course. 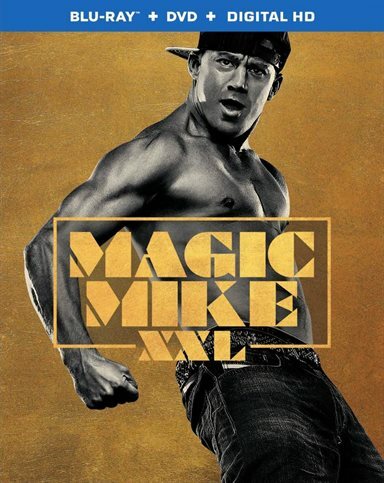 Download Magic Mike XXL from the iTunes Store in Digial HD. For more information about Magic Mike XXL visit the FlickDirect Movie Database.